Deer may be beautiful and elegant, but they aren’t always welcome in the garden. Even just a few visiting deer can tear up a landscape, eat an entire crop, destroy a carefully cultivated bed and cause other havoc, such as creating a traffic hazard, damaging bird feeders or leaving behind unwanted “gifts” on sidewalks and pathways. But how can you keep deer out of your yard and away from your garden and landscape? All of these methods work but are limited in their effectiveness. Fencing is costly and unsightly. Repellents and urine wash away. Sprinklers or lighted areas can be easily avoided. So what can you do to keep deer away permanently? Deer are creatures of habit and they are easily scared. Anything you can do to mix up their habits or make them think there is danger nearby might be enough to make them go elsewhere in search of food. 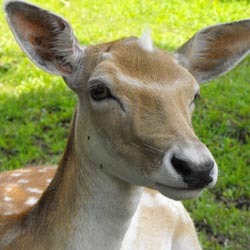 But deer aren’t foolish and if they realize the danger isn’t real, they will return. Therefore, you must rotate any scare tactics you try and reapply repellents frequently. This can be a lot of work to keep your garden safe, but you can make your garden do the work for you. While deer in large herds with insufficient food will eat almost any garden vegetation, particularly in harsh winters, you can opt for plants that aren’t popular with deer to minimize deer damage. At the same time, avoid planting favorite deer plants, such as azaleas, rhododendrons, yews, roses, Japanese maples, winged euonymous, hemlocks and arborvitae, as well as any edible garden produce. Try using these less deer-friendly plants to create a dense border around your yard and garden area, and deer will be less inclined to work their way toward the tastier plants. When combined with other deterrent techniques, it is possible to have a stunning landscape without being stunned by deer damage. This entry was posted in Fall, What's Bugging You on March 28, 2018 by admin.